WHY SHOULD WE CARE ABOUT WOODEN PADDLES? Mainly because the wooden paddle is one of the best tools we have for growing our sport faster. We rarely sell a wooden paddle to an individual player. Don’t even try to. What a wooden paddle does is helps us eliminate one of the main barriers (COST) to finding new places to play. An under $10 paddle opens up a myriad of new places to play very quickly and allows us to grow the sport faster. We just recently opened a new church to pickleball. We put a good composite paddle in the pastor’s hand to try it. After he loved it, we explained that we could have them up and playing for under $200. We ordered the USAPA net and 4 wooden paddles for them. We donated a couple of balls to show good will and we now have 3 new indoor courts open to our community. We did the same thing with a local fitness center last month. We put a paddle in the owner’s hand to try pickleball. As soon as he was hooked, we sold him a net and 4 wooden paddles for $200. We donated a few balls. Now there is pickleball there every single day. When you are trying to get places to play, the first thing that place looks at is the cost to get started, and we have found there is a big difference in their cooperation and willingness to get started when you tell them it’s under $200 to get started as compared to $400+ for better paddles that they have to worry about getting beat up or taken. They don’t have to worry about a wooden paddle walking off or getting damaged so their stress level is less. I’ve heard some people say we are doing players an injustice when we start them with a wooden paddle. PLEEEEEASE!!!!! Give those new players some credit. From our experience, we rarely end up selling any wooden paddles to a facility’s new players nor do we try to. Weeks after starting a new location, we walk in and we don’t see any wooden paddles. Everyone is using decent paddles. The new players just naturally want a good paddle. They don’t have to be told or sold. I might be off base, but I believe our number one goal as players, and as ambassadors is to grow pickleball and that is done most efficiently through starting new places to play. Everything else seems to take care of itself. 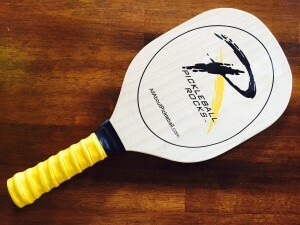 At www.ThePickleballPaddleFoundation.com, you can buy a good, almost indestructible wooden paddle that is under 10 ounces for under $10 with FREE shipping. It plays quite well. We’ve tried it numerous times. By the way, if you really feel you need to have a bag full of composite paddles before you can teach people the game then, if you are a free member of The Pickleball Champions Club, you receive, as part of your free membership, a personal use coupon good for 10% off any Pickleball Rocks gear, including paddles, at PickleballShopping.com. That would put you into the world famous Pro-Lite Classic composite paddles for around $43. Personally, when I’m going to teach, I have my 2 “good” paddles in my bag and 2 wooden ones so I can just get a foursome on the court to experience the game. I don’t have much invested and that’s all I need to help pickleball grow. Keep up the good work(s) everyone.